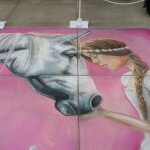 So when they accepted my design I submitted, and I was getting ready for the event, it dawned on me I had 2 days to do a 10 x 10 ft portrait on the concrete. I cant lie, I started to panic! How would I create this in just 2 days with no experience in this medium? Well after day one I was feeling a lot better since I had accomplished quite a bit. 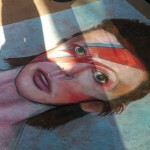 The medium was not as hard to work with as I expected and it blended nicely. I also fell in love with the process. Especially the interaction with the crowd. I had spent 15 years working in peoples homes and businesses and have never created art in front of an audience. It was a little scary at first, but then it became like performance art. Peoples reactions were so rewarding!! I finished with a little time to spare and was thrilled with the end result! My body was aching, I was quite burned from the sun and my fingers were a little cut from the concrete, but overall, I loved the experience!! So since then, I have gone on to do several more pieces, mostly for Southern Art and Cultural Alliance in AZ, SAACA. I also have had the opportunity to be on the news several times promoting their events. It has been a great experience. So I guess good things can come out of bad. 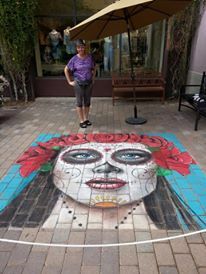 If I wouldn’t have broken my ankle, I do believe today, I would not be a speed painter, live portrait painter and chalk artist!! 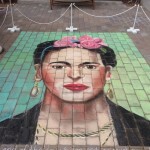 Blog Arizona, chalk art, David Bowie, day of the dead, Frida Kahlo, Gina Ribaudo, I Love Murals, SAACA, street chalk art. permalink.